A priceless, evocative comedy-drama, Alexander Payne's "Nebraska" is an absorbing meditation about Woody Grant, a drunken, curmudgeonly octogenarian who's convinced he's struck it rich with a $1 million haul from a Publishers' Clearing House-type outfit. Woody (Cannes 2013 best actor winner Bruce Dern) compels his exasperated son David (Will Forte) to drive him on a 19-hour journey to Nebraska to claim his prize. The laconic Woody has little in the twilight of his life except this dreamlike calling card to fame and glory. It's a fantasy he won't let go of. That, and alcohol, are Woody's only reasons to live. David, who toils at his job, knows the letter to Woody is absurd. Kate (June Squibb), Woody's saucy, foul-mouthed wife, has particularly blunt feelings about Woody's "win". She is the film's singular town crier, raising hell and gossip at every turn about everyone. As Kate, Ms. Squibb, a likely Oscar nominee, is spectacularly funny, employing a drop-dead, take no-prisoners approach to a character not unlike other Payne film characters (she played one in "About Schmidt"), though Bob Nelson wrote the crackling, whip-smart "Nebraska" screenplay. In the confines of Lincoln, Nebraska word travels fast, and word of Woody's chance to be a big fish in a small pond has already outrun him. Twin brothers hilariously sniff out David for the crumbs of Woody's imagined riches, as do others, including unscrupulous local Ed Pegram (a great Stacy Keach), whose threats against the Grant family aren't idle. Ed is the film's dark, brooding underbelly, embodying a side of Nebraska that daytime smiles and quaint hospitality conceal. "Nebraska" takes stock in its honest look at the state and its capital city, offering a different and layered take on America's heartland, exploding and exposing some of its myths, stereotypes and mysteries. Mr. Forte, in his first major dramatic feature film acting, is excellent as David, a quiet son whose melancholic demeanor and gradual warming to his father's stubborn quest for a piece of the American dream is shrewdly internalized and modulated. 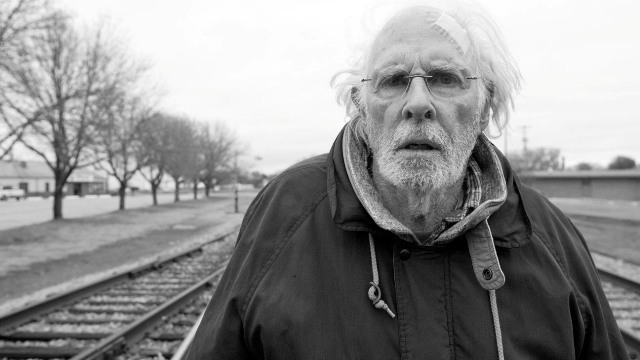 These silent percolations give "Nebraska" its sophistication and much of its risible drama. Mr. Forte, whose work here is even more impressive than Mr. Dern's, matures on screen before our eyes as the story progresses. He complements Mr. Dern well, every bit the veteran actor's equal. David arguably fights harder for the Grant family name than Woody does. Yet in his own way Woody seeks to plant the Grant name in the soil of a town where whole families catatonically stare at TV screens without so much as three sentences spoken between them. Phedon Papamichael's fine cinematography captures plaintive and vacant faces, each portraits of life. Mr. Payne's direction doesn't spare us their expression in bold, even daring lingering still shots that allow us to absorb the fabric of their mundane and idiosyncratic lives. There's a bluntness yet a tender, homely comfort in these folksy men and women that connects us to them, even if most of us don't live near Nebraska. For so long Mr. Payne has been adept at capturing the personality of the environment he patrols, and is so exacting at punctuating the signature, unique identities contained within it. Shot in glorious black and white, "Nebraska" captures the easygoing, glacial-paced life of its residents and their attitudes. Some of the characters are caustic, others cynical, still others naive, quirky or calculating. Mr. Payne captures the authenticity of all of these types so resonantly and unmistakably. Each shot in "Nebraska" is indelible, a Rockwellian postcard of life, beauty and humanity that unapologetically declares, "this is who we are." "Nebraska" is rated R by the Motion Picture Association Of America for some language. The film's running time is one hour and 55 minutes.